With a 7 AM call time for our video shoot in Sunset Park, Brooklyn, the ASL team and crew met outside GUM studios, a massive production facility tailored to commercials, films, TV shows, music videos, and high-end photoshoots. Preparation – In the props department, a lot of work needed to be done ahead of time for this video shoot. For starters, they needed to create six different backdrops against large flats that would cycle in-and-out throughout the shoot. Directorial instructions were to go with a very loud, bright, and eye-catching aesthetic, while mixing in Holiday colors and themes. To make the set a memorable one: DIY disco balls, Astera programmable lights, accessories, and lots and lots of confetti were among the many props we delivered. Location – Before the video shoot date, we looked at a number of studios around Brooklyn and Manhattan, with size and affordability being the two biggest factors. Gum’s brand new Chiclet Studio checked off both of those boxes, while offering us plenty of space for the crew and art/makeup/style departments, all at an affordable price. We also liked the “industrial-chic” feel of the neighborhood, which played really well when shooting our outdoor shots. 7:30 AM – Once in Chiclet Studio, our first step was situating video crew, talent, agency and client. 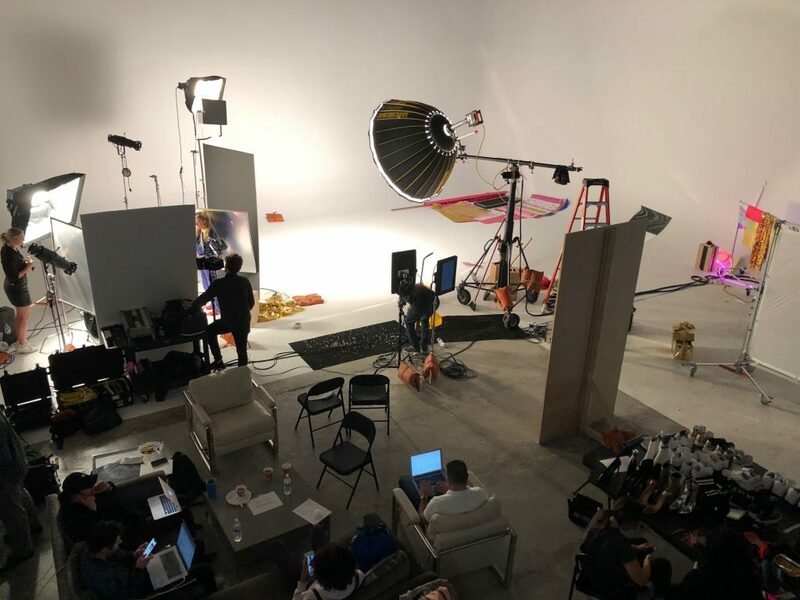 We mentioned earlier that the studio provided ample space for a large production, but we still needed an efficient layout for each department: Where the props department were going to keep all their materials, where the video village would be stationed, where catering would layout their buffet, where hair and makeup and wardrobe would go, etc. 7:50 AM – With video crew situated in their designated locations, we needed to make sure everyone had the tools necessary for a successful day. For Hair & Makeup, this meant mirrors and lighting to see their work. For Wardrobe, racks, hangers, and privacy for the models while changing. All of this was requested from the studio ahead of time and was on site, but getting it to its proper place and person still takes some time and organization. While that was taking place, lighting was getting their stands and lights in order. Our key light was the first to go up, a huge Briese Focus 140 HMI with an extra-large umbrella. Working with a Briese is a treat since it produces bright, beautiful true color and very soft almost nonexistent shadows. It’s a perfect light for fashion shoots. Determining the intensity of the key light was one of our first production moves. 8:00 AM – Time for our camera build. An Alexa Mini with Zeiss prime lenses being setup to move seamlessly from tripod to Healix Gimbal. While that was happening, we were also setting up our video village and using a Teradek wireless system so the AC could pull focus using his Small HD 702 monitor, while the client could view the action on a larger Panasonic 18 inch client monitor and our director could also walk around holding a 7 inch portable directors monitor. We needed 1 Teradek system with 3 receivers to make this happen and while splitting the signal did have some occasional monitor snags, for the most part it proved to be a successful wireless solution for our multiple needs. 8:30 AM – We wanted movement for this shoot while keeping the talent in a controlled space. To accomplish this, we purchased an under-desk treadmill (no arms, just the track part) so the models could walk on the treadmill all while staying in a similar focal range. We then keyed the treadmill they were walking on out in post-production. 9:00 AM – Filming begins with first model, first outfit combination. We used a V flat to tape up print outs to keep us organized. The print outs contained each fashion look and model who was supposed to be in the scene and we also hand wrote the time each scene was supposed to take place. This proved very effective for keeping us on schedule and was a great reference for our Assistant Director to know when we were falling behind or had to move things in our schedule around. It also helped us keep track of the amount of camera time each model was getting and making sure we had a good diversity of shots for both outfit and model. Bring that Video Shoot Energy! 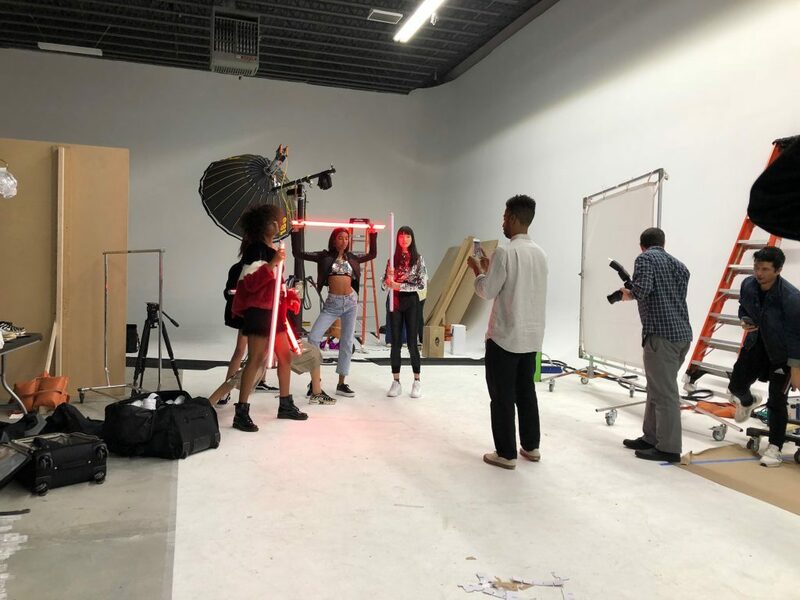 It was time for us to get the music pumping in the studio which helped not only the models performance, but brought up the spirits of the entire crew. Our director, Amilcar, was very focused on the models exuding happiness and confidence for our video shoot. He also oversaw the music selection to help deliver this performance. Thankfully no audio was being recorded so we could pump the jams while we filmed. 10:30 AM – We had 6 different background looks to move into place throughout the day. Now it was time for our first background swap. Thankfully these were pre-build against flats so all we needed were the grips to move them in and out of place. It was crucial to Amilcar to have the models be active and stray away from stationary posing. In each set, we would produce “mini moments” within each scene, such as having confetti falling, or catching presents, all of which added a sense of energy and spontaneity that would be hard to capture otherwise. 12:00 PM – Lunch Break is called. Delicious food is not the only thing to worry about when making sure everyone gets fed. When ordering meals for talent, crew, client and agency, you have to take all meal options into consideration. Especially vegetarian, vegan and gluten free. When everyone gets a good meal, they are ready to get back to the video shoot with a tasty pep in their step. 1:00 PM – As we mentioned earlier, we had six different backgrounds that we worked with! With five different models, and endless combinations of outfits, this made for a variety of different shots that we needed to capture. 2:00 PM – With countless combinations run through, we headed for outside to get some tracking shots of the models walking down the street in some warmer clothes. 3:00 PM – To make sure we had full coverage for every look, we had the models walk down the same block multiple times. the first take we would focus on the outfit, the next their feet, the third their face, etc. Our 3 wireless monitor system was very helpful to allow our director, AC and client see our shot in real time. 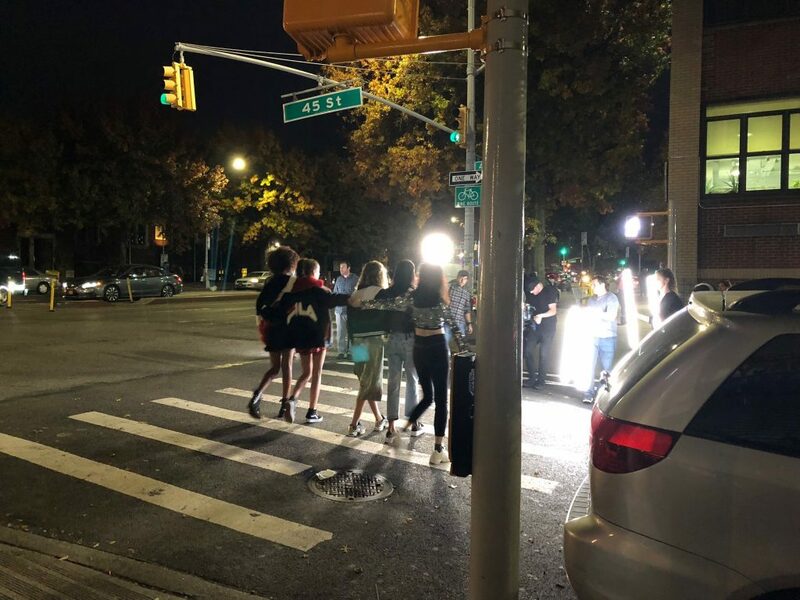 5:00 PM – As the sun is going down, the crew and models head for the streets of Brooklyn to shoot a final tracking shot of the five of them walking together down a classic NYC street (neon signs, subway entrance, and all). From “working out” on the treadmill, to “hanging out” with each other, we needed shots of the models “going out” on a night on the town! What better time to bust out the Astera lights? 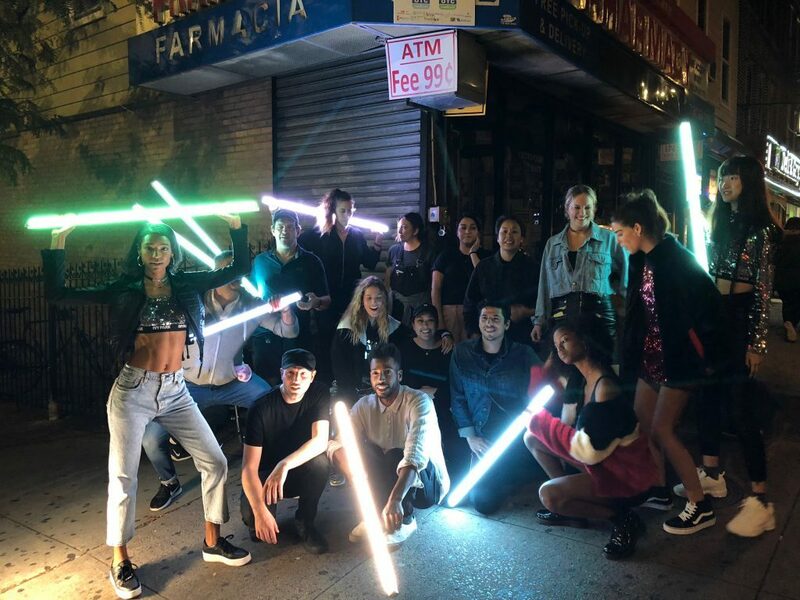 So now we had five fashion models strutting down the streets of Brooklyn carrying these crazy light saber-like light sticks! Needless to say, people on the street were curious as to what was going on, but we’re used to that by now. A choice quote came from a young girl that asked if those were ‘real’ models. We responded that, indeed, those were real models, to which she turned to her sister and said, ‘Awesome! I can’t believe I just met a real model!’ Unfortunately, she didn’t get to go home with a souvenir Astera. 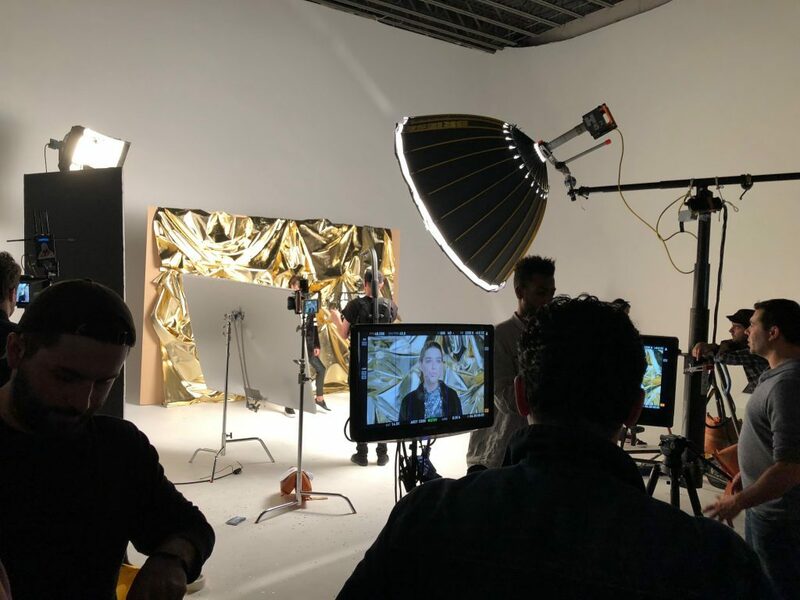 6:00 PM – While the final shots of our video shoot day were being wrapped up, other members of the team were busy cleaning and packing up the remainder of the set back at the studio. 7:00 PM – Now that we had some beautiful street shots in the bag to top off the day, we were ready to call it a wrap! “Things went really well considering it was a very demanding schedule for a one-day video shoot. Having to make sure we were constantly filming, and well prepped for the next scene was the most challenging part. This meant, making sure the model who was up next was in make-up and in proper wardrobe, ready to go. And it also meant grips/stagehands were at the ready to move in our next backdrop. By constant communication from department to department, with everyone checking in with each other and adjusting on the fly, we managed to pull off a very smooth shoot. Take look at the 60 second video here.